Your tax-deductible donations provide basic human needs to those who make our world more beautiful with their music. 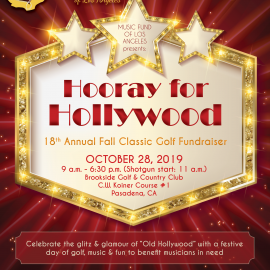 Join us each year for our annual Summer of Salsa free concert series, and learn about our Annual Fall Classic Golf Tournament bringing together live music, golfers, musicians, board members and many others in support of our mission. Are you a professional musician residing in Los Angeles who has fallen on hard times? You may be eligible for assistance. California musicians suffering from the wildfires, or otherwise in need of emergency disaster assistance, may apply for aid from the Music Fund of Los Angeles here. To learn about additional community resources, or how you can donate to the Entertainment Industry Fund’s fire relief program, click here.